More than 215, 000 people will benefit from a Euro 14 million multi-faceted housing project, financed by the European Union (EU), and implemented by Habitat for Humanity and World Vision Lanka. Speaking during the opening ceremony, Ambassador to Sri Lanka and the Maldives for the Delegation of the European Union (EU), HE Tung-Laï Margue said, "I am hopeful that this project will assist in providing returnee families with not just homes and livelihood alternatives but also the necessary support to rebuild a life and a future for themselves. The goal has always been to turn the cycle of impoverishment and reliance to that of self-sufficiency, and I am encouraged to see that we are moving in the right direction through this initiative". 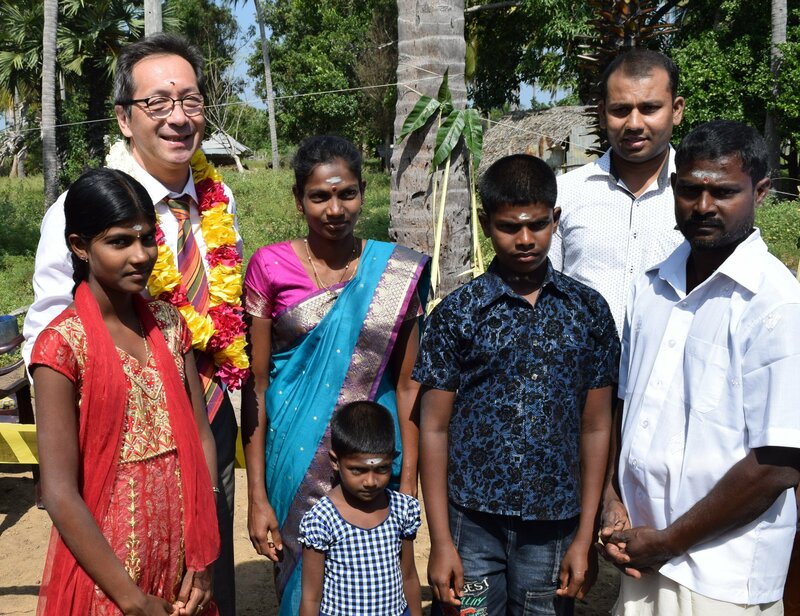 The project, which bridges the gap between relief, rehabilitation and development, aims to build 2,315 houses and repair 140 homes in 31 divisions across Batticaloa, Kilinochchi and Mullaitivu by early 2020. It utilises alternative materials and techniques to reduce constructions costs, while ensuring decent housing, and to encourage the use and production of locally manufactured earth blocks and construction materials. “The project is aptly entitled ‘Homes not Houses’. Indeed we wish to see thriving communities that are self-sufficient, stable and strong, once our building work is done and we are long gone. Thanks to the focus of this funding from the European Union the project aims to boost the local economy by investing in earth-based technologies which are cost-effective and sustainable,” said Dr. Dinesh Kanagaratnam, National Director of Habitat for Humanity Sri Lanka. Access to permanent housing including houses built with innovative materials (compressed stabilized earth blocks and earth concrete blocks). Appropriate incremental building through microcredit to expand a home or create a place of business. “Flanking measures” relating to general livelihood support for families and communities such as vocational training in construction, training in appropriate building materials and methods, and forming and strengthening small and medium enterprises. Training families in financial literacy including savings plans, microfinance and basics of business. Improved access to appropriate microfinance and management of debt. A more holistic approach of strengthening community-based organizations, supporting disaster risk reduction, peace building and gender equity. World Vision is a Christian, relief, development and advocacy organization dedicated to working with children, families and communities to overcome poverty and injustice. The organisation serves all people, regardless of religion, race, ethnicity, or gender and has been in Sri Lanka since 1977. The organization has 45 programmes spread across 19 Districts in the country.